Anne Catherine Emmerich was born to poor parents at Westphalia, Germany in 1774. When she was twenty-eight years old she became an Augustinian nun at Dulmen, and apparently began to experience ecstasies as a result of spiritual favors. She received the Stigmata in 1813, confined to her bed, and reportedly convinced a vicar-general, Overberg, and three physicians of her sanctity. She later reported that she had seen visions of Christ and the souls in purgatory as a child, as well as a circular core with three sections representing the Trinity. She is the author of The Dolorous Passion of Our Lord Jesus Christ, The Life of the Blessed Virgin Mary, Life of Jesus Christ and Biblical Revelations, and The Bitter Passion and the Life of Mary. Anne Emmerich died on February 9, 1824 and was beatified by Pope John Paul II in 2004. 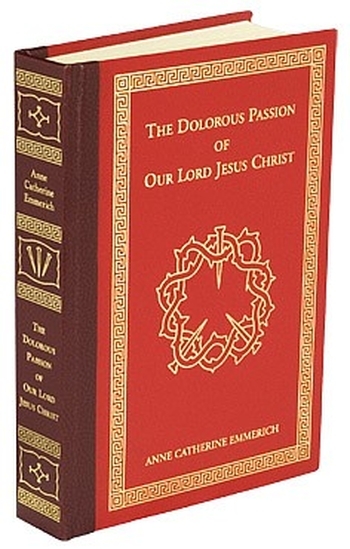 Dimensions: 5.5" X 8.25" X 0.88"
Anne Catherine Emmerich’s writings are the best-known account of the Passion after the Gospels, and influenced Mel Gibson’s blockbuster movie The Passion of the Christ. Read the transcription of a series of visions by a great mystic and stigmatic, who was recently beatified by the Church. Full of fascinating details concerning every aspect of the Passion, the Last Supper, the Descent into Hell, Our Lady and the Apostles. The people, places and cultural background surrounding these momentous events, are captured in detail, many of them verified by recent scholarship. This edition has been freshly re-typeset from an older, traditional edition and printed on high quality, acid-free paper. The cover is bound in genuine, highly-durable, leather with beautiful ornamental gold blocking on the front and the spine. Probably the most famous book ever written on the Passion, it is actually the transcription of a series of visions by a great mystic and stigmatist recently beatified by the Church. Full of fascinating details concerning every aspect of the Passion, the Last Supper, the Descent into Hell, Our Lady, the Apostles and the people, places and cultural background surrounding these momentous events - many of them verified by recent scholarship - this book was a powerful influence on Mel GibsonÿÙŽs film The Passion of the Christ. 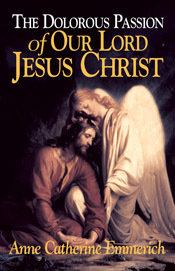 One of the most powerful devotional books in all of Christian Literature. To celebrate the release of the first five Classic Series titles, the Dolorous Passion has been made with a split color leather binding, limited to the first edition only! Size - 5.5" x 8". Hardbound (split bound in burgundy-blood read real leather) with silk ribbon marker.